The young male Peregrine falcon, Sharib, disappeared for a few days around July 4. We are not sure if the fireworks and all the celebrations sent him looking for a quieter environment, but he returned on July 7 and has been around Peregrine Central ever since. He has a robust appetite and begs his parents for food at every opportunity – a true teenager! Hopefully, he is catching some of his own prey by now, but Rebecca is an indulgent Mom and makes sure he does not go hungry. Unfortunately, Apex has not been spotted since her release on June 24. 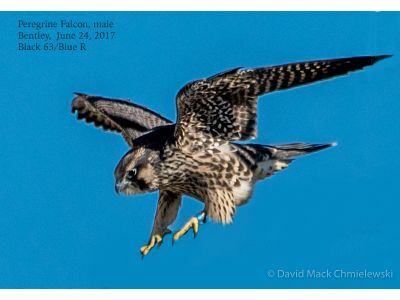 If she was in the area, she would most likely be with the other falcons. We can only hope that she is alive and safe. Rebecca and Kewpee are typically in the Peregrine Central area (around the Fifth Third Bank and WMU School of Medicine). There are regular visits to the nest box by all three falcons during the day, and the front edge of the box is a frequent perch with a splendid view of the territory. It is fun to watch Sharib as he comes into his own as a young Peregrine, knowing that he will probably take off for his own adventures in the next few weeks.